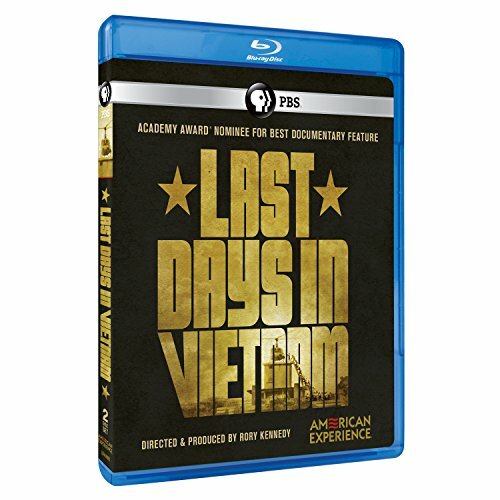 Arlington, Va. – March 16, 2015 – PBS Distribution announced today it is releasing American Experience: Last Days in Vietnam on DVD and Blu-ray. April 1975. During the chaotic final days of the Vietnam War, as the North Vietnamese Army closed in on Saigon, South Vietnamese resistance crumbled. City after city and village after village fell to the North while the few U.S. diplomats and military operatives still in the country contemplated withdrawal. With the lives of thousands of South Vietnamese hanging in the balance, those in control faced an impossible choice––who would go and who would be left behind to face brutality, imprisonment, or even death. Last Days in Vietnam , directed by Rory Kennedy, will be available on DVD and Blu-ray April 28, 2015. The run time of the theatrical version of the film is approximately 100 minutes, and the run time of the extended broadcast version of the film is approximately 120 minutes. The DVD SRP is $24.99 and the Blu-ray SRP is $29.99. The theatrical version of the program will also be available for digital download. In 1973, the Paris Peace Accords had forged a tenuous ceasefire and limited U.S. military involvement to the presence of approximately six thousand non-combat troops and advisors. While President Nixon promised a swift military response should the North Vietnamese violate the agreement, his abrupt departure from the White House in late 1974 left in its wake a Congress unwilling to appropriate funds to Vietnam or put U.S. soldiers back in harm's way. By early March 1975, huge swaths of territory were overrun daily by the North Vietnamese Army, and by the end of the month, they had surrounded the capital, preparing to launch their final assault on Saigon. As the inevitability of a communist victory became clear, the U.S. diplomats and military operatives still in Saigon grew increasingly concerned for the safety of their South Vietnamese allies, co-workers, and friends. Even the most ambitious U.S. evacuation plan allowed for the transport of just a few thousand South Vietnamese refugees. By April 25, the number of people in Saigon wishing to flee swelled far beyond that projection. Yet even as the North Vietnamese troops drew close to Saigon, U.S. Ambassador Graham Martin, himself the father of a fallen Vietnam veteran, steadfastly refused to discuss an evacuation, both for fear of panicking the South Vietnamese population and out of a stubborn reluctance to admit defeat. On April 29, the airport in Saigon was bombed, leaving few options for evacuation. What ensued was a desperate scramble to board one of the helicopters carrying refugees to a small fleet of ships floating just offshore in the South China Sea. U.S. Navy ships, initially sent to offer support and protection to Americans, rapidly and unexpectedly played a central role in the frantic evacuation, taking aboard both American and South Vietnamese helicopters, and countless evacuees. However, most of the action on that final, fateful day took place at the besieged U.S. Embassy in Saigon, where thousands of South Vietnamese scaled the walls in hopes of securing a last-minute evacuation. As desperation rose and time grew short, Ambassador Graham Martin used American resources meant for his own protection to extract thousands of South Vietnamese during an airlift from the embassy compound. Director of Photography Joan Churchill, A.S.C. Rory Kennedy (Director/Producer) is an Emmy Award-winning independent documentary filmmaker as well as co-founder and president of Moxie Firecracker Films. Her films cover an array of issues ranging from poverty to politics to human rights. Her work has been shown on PBS, HBO, A&E, MTV and Lifetime. Her most recent project, Ethel, premiered at the 2012 Sundance Film Festival, was broadcast on HBO and nominated for five Primetime Emmys. Kennedy has directed and produced more than 25 documentaries including Ghosts of Abu Ghraib (Primetime Emmy Award for Best Non-Fiction Film, 2007); Thank You, Mr. President: Helen Thomas at the White House; American Hollow; A Boy's Life; and Pandemic: Facing AIDS. Mark Samels (Executive Producer) was named executive producer of American Experience, PBS' flagship history series, in 2003. Under Samels' leadership, the series has been honored with nearly every industry award, including the Peabody, Primetime Emmys, the duPont-Columbia Journalism Award, Writers Guild Awards, Oscar nominations, and Sundance Film Festival Audience and Grand Jury Awards. Prior to joining WGBH, Samels worked as an independent documentary filmmaker, an executive producer for several U.S. public television stations, and as a producer for the first co-production between Japanese and American television. A native of Wisconsin, he is a graduate of the University of Wisconsin-Madison. Television's most-watched history series, American Experience celebrated its 25th anniversary in 2013. The series has been hailed as "peerless" (The Wall Street Journal), "the most consistently enriching program on television" (Chicago Tribune), and "a beacon of intelligence and purpose" (Houston Chronicle). On air and online, the series brings to life the incredible characters and epic stories that have shaped America's past and present. Acclaimed by viewers and critics alike, American Experience documentaries have been honored with every major broadcast award, including 30 Emmy Awards, four duPont-Columbia Awards, and sixteen George Foster Peabody Awards, one most recently for the series represented by Freedom Riders, Triangle Fire, and Stonewall Uprising. Exclusive corporate funding for American Experience is provided by Liberty Mutual Insurance. Major funding provided by the Alfred P. Sloan Foundation. Additional funding for "Last Days in Vietnam" provided by The Arthur Vining Davis Foundations: Dedicated to Strengthening America's Future Through Education; The Documentary Investment Group: Gretchen Stone Cook Charitable Foundation; Roxanne E. & Michael J. Zak; and by the Corporation for Public Broadcasting and public television viewers. American Experience is produced for PBS by WGBH Boston.